Last week was better than expected with a Big Eye Tune circa 200 lbs being landed and released on Thursday and a White Marlin being caught and released on Friday. The Tuna was caught on a light 50 lbs class rod and reel combo with only 60 lbs mono line and 200 lbs braid backing. The lure was a moldcraft wide range blue/white with a 10/0 hook. The fish started off by breaching and then deciding to race the boat and it was all we could manage to keep line on the reel. Judicious use of the boat was required to start getting the fish under control. The angler was a rank novice (first time fishing) and thankfully he acted promptly to instruction and did very well indeed. No photo of this fish as the camera was not working. TYPICAL!!!!!!!!!!!!!! 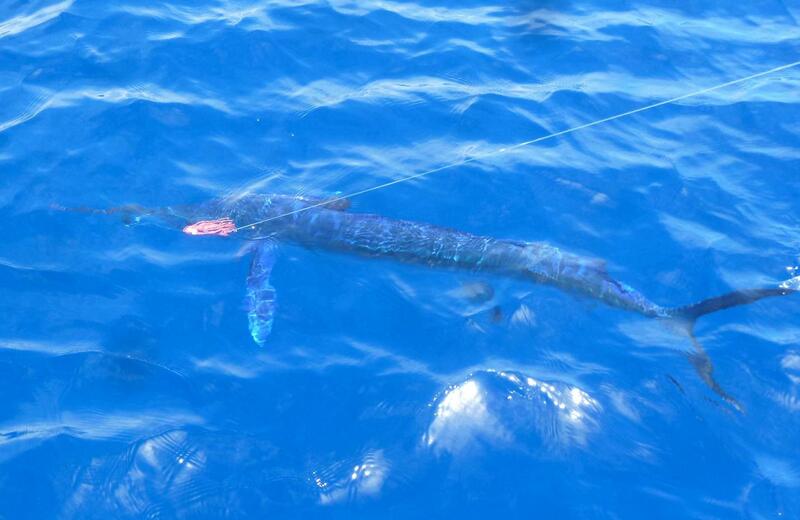 The White Marlin took a Williamson lure of 6” in pink and was boated within 10 minutes. As is normal a lot of show with tail walking etc… but not much stamina. However, in addition to our catches 3 Blue Marlin in excess of 600 lbs have been boated and successfully released by other boats in our Marina. So clearly things are at last starting to hot up. Conditions were a little choppy and therefore more challenging to fish. Since Friday the conditions have calmed right down and today is flat calm. We still have space in July and August which are traditionally the best months for big Blues. So, reserve your space now and avoid disappointment. This entry was posted in Madeira by anglersworldinfo. Bookmark the permalink.